In a store full of top quality fashion essentials, saving money is a dream come true! 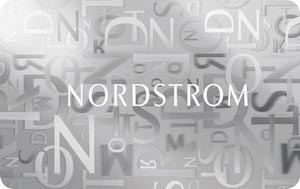 A Nordstrom gift card purchased at a discounted price will save you money on clothing, shoes, bags, jewelry, and accessories. And with hundreds of stores conveniently located nationwide, finding a store is easy! Just think of all the beautiful designer brand merchandise you can buy- for less money! What’s more, you can find high-quality apparel and accessories for everyone on your list. Purchase your discounted card today and shop fine quality clothing without breaking the bank. Have you been feeling a little hum-drum recently? Update your make up by purchasing a discounted Nordstrom gift card today then visiting their top-notch beauty counter. Their expert staff will make you look and feel like a star as you shop premium brand makeup and fragrances. And the best part is, you will only pay a fraction of the retail price. Isn’t it time to let your glamour shine? And while you are there, be sure to check out their wonderful selections of house furnishings and gifts. This is one store where you can find it all- housewares, gifts, shoes, apparel and more by the most sought-after designers on the market. So, now you know. It actually is possible to look your best for less. You, your family, your house, probably even your dog, will look better than ever before while paying less money! Your budget will thank you when you buy a discounted Nordstrom gift card to shop their Anniversary sale this July. Known as the company’s best sale, you will pay far less than retail for the very same luxurious fashion merchandise. Who doesn’t want designer merchandise for less money? And with departments in housewares, men, women, children, shoes, and more, you can find everything you are shopping for. And don’t forget! Gift cards make fantastic presents too! Surprise that special someone in your life with one today and let them shop away the day in style. Nordstrom is known for its exceptional customer service. Use your discounted Nordstrom gift card today and receive the same great service and merchandise, without paying full price. But that is only the beginning of the savings opportunity Cards2Cash has to offer. We carry a great selection of discounted cards. Be sure to check out our listings for Neiman Marcus, Macy’s, Bloomingdale’s, Saks Fifth Avenue and more. We also have them for many other retail shops. In fact, we carry discounted cards for everything from drug stores to ice cream shops! Don’t love Nordstrom but somehow wound up with a Nordstrom gift card? We always need gift cards from department stores like Nordstrom, Macy’s, Bloomingdale’s, and Saks Fifth Avenue. It’s easy to get top dollar for your unwanted cards. You can pop into one of our retail locations and we’ll give you cash on the spot, or you can fill out our simple online form and we’ll email you a great offer.